Ever since LeBron left the only thing significant about Cleveland is...Sorry, can't really think of anything at the moment. 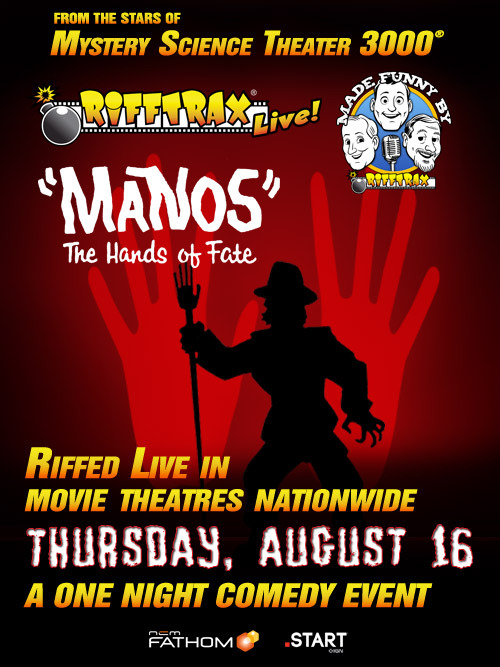 That's probably because the coolest place in the country to be right now is the secret location where the "RiffTrax" team has set up to do a live simulcast this Thursday of the cult-horror turkey-among-turkeys MANOS THE HANDS OF FATE. I've heard it's happening in that classic old theater in the heart of Knoxville, Tennessee, but there's been talk on the internet since May that the gig goes down at the Belcourt at Nashville (where tix are already sold out, notably). Point is, it's not in Cleveland - though it will be simulcast here. RiffTrax, you hopefully know, is the successor to TV's beloved Mystery Science Theater 3000, with cast members Mike Nelson, Kevin Murphy and Bill Corbett doing their schtick heckling an all-new soundtrack of wisecracks and commentary to an old, er, favorite. MANOS THE HANDS OF FATE was a backyard chiller effort made in El Paso, Texas in 1966 as the first and last feature from director-actor Harold Warren, an inept would-be shocker about a family stranded a weird ranch that secretly houses a devil-worship cult. Largely ignored or a bottom-shelf item in some of the more eldritch 16mm film-rental catalogs, MANOS resurfaced in 1993 when Mystery Science Theater dismembered it with Joel Hodgson, Crow T. Robot and Tom Servo. Audiences who had never encountered MANOS before decided, yes, this was indeed a strong candidate for Worst Movie Ever Made. 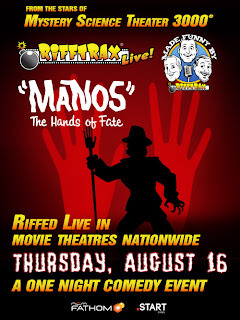 MANOS will get "riffed" on Thursday, August 16, at 8 p.m. Eastern Standard Time, with local cinemas getting the simulcast feed through FathomEvents being the Regal Cinemas in Valley View, Westlake (Crocker Park) and Hudson, the Cinemark 15 in Macedonia and the Cinemark at Strongsville's South Park Mall; and the Severance Stadium 14 in Cleveland Heights. I knew there had to be some redeeming quality to Cleveland Heights. Tickets are on sale via the website www.fathomevents.com or by calling the individual theaters.